An engagement ring is an important symbol of everlasting love, and we want to help you choose the perfect one. Before choosing a ring, it is good to know about the product you are buying, so we have answered some fun FAQs here to get you started on your Diamond Engagement adventure! Color refers to the actual body color of the diamond. GIA grades D,E,F are considered colorless. G,H,I,J are in the near colorless. Any grade below these usually show tints of yellow, browns, or possibly gray in the diamond. Some stones are called top light brown, have a silvery-brown tone and do not seem to be that apparent in color. Color becomes more apparent as the stone gets dirty from wear. These off color stones are much lower in price. Clarity refers to the type, location and size of the imperfections in the diamond. On the GIA scale, FL means flawless, or no visible imperfection to a trained gemologist under ten power corrected magnification and lighting. These diamonds are rare. VVS1 and VVS2 (very very slight imperfection to the first and second degree), may have a very small imperfection or two in the stone. VS1 and VS2 (very slight imperfection to the first and second degree), may have a grouping of very small transparent imperfections. SI1 and SI2 (slight imperfection to the first and second degree), may have a feather, included crystal, or fracture in the stone. This imperfection is readily visible under the microscope, but not visible to the eye. I1, (imperfection to the first degree), may have all of the imperfections in the SI grades, but larger or more dominate. This grade can be assigned to stones that you may or may not see the imperfection with the eye. I2 and I3 (imperfections to the second and third degree), are heavily flawed stones, the imperfection may increase as the stone is worn. The imperfections in this grade take away from the beauty of the diamond. Obviously, the lower the grade, the lower the price. It is important to have a gemologist grade the diamond you are considering, that way you know what you are buying. 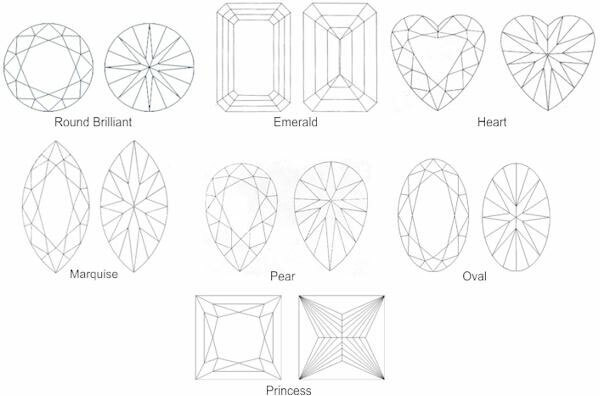 Why is the cut (proportions, not the shape) important on a diamond? Cut is one the C’s in a diamond that is not referring to the shape (ex. marquise, round, pear shaped) but to the proportions of the stone cut. This is important because of the way light flows through the stone and back to your eye. A properly proportioned diamond is cut so that the light that enters the top of the stone reflects off the back facets and exits out of the top of the stone. A diamond that is cut too shallow or too deep allows the light to exit out the back or sides of the stone. This darkens the diamond and it is not as bright and lively as it should be. It is also less expensive than a properly cut diamond of the same grade. What Shapes do Diamonds Come in? Generally speaking, after the considerations of the 4 C’s; Cut, Color, Clarity and Carat weight are made, shape decisions are a personal choice. Whether you prefer the symmetry of the Round Brilliant, the long shape of the Marquise or Oval, the softness of the Emerald Cut, or the combination of brightness with emerald shape of the Princess and Radiant Cut diamond, is your personal preference. Do Diamonds Form in Colors? Yes, beautiful ones! Diamonds form (although rare) in red, pink, blue, yellow, brown, blacks, orange and light green. The intensity and purity of these colors makes the diamond more valuable. Clarity is not as strongly considered in these very rare stones, unless it is distracting from the beauty of the stone. The natural formed color in diamonds is rare and should be certified as natural. The man made irradiated version of color diamonds is also beautiful, but not as expensive. The process takes lower color diamonds and irradiates these stones to produce strong greens, blues, oranges, etc. Why are Prices on a Particular Size Diamond so Different? All the four C’s attribute to the price of the diamond. You can use them in your favor to find the diamond of your dreams in your price range. Also these 4 C’s can be used to trick you if you are not careful. For example you have a Round Brilliant Diamond G-H in color, SI2 in clarity, but the cut is poor. Not only does the stone’s beauty diminish, the price naturally goes down. Be careful not to be misled to think this is a “great” price unless you really compare all 4 C’s. Does 10k Gold Wear Better than 14k Gold? It is true because 10k contains more alloy (10 parts gold, 14 parts alloy), it is slightly harder. But so many 10k pieces are made in promotional quality, (ex. lighter weight). While if the same piece was made in the proper weight in 14k it would wear longer and harder. (14k is 14 parts gold and 10 parts alloy).